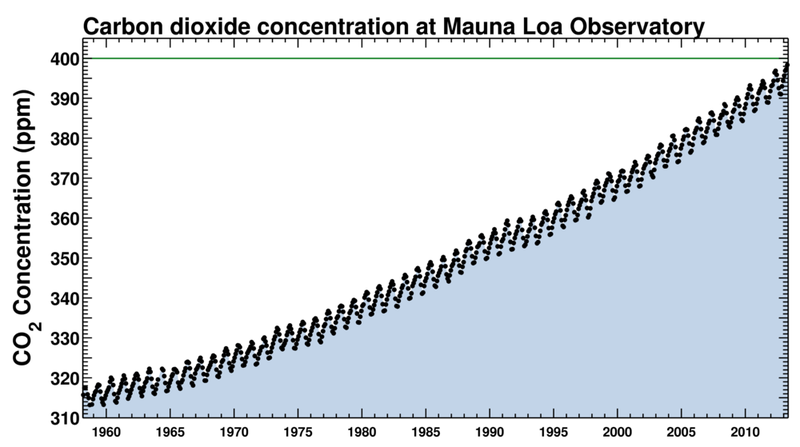 Keeling Curve’s graph showing rise of CO2 levels from 1958 until today measured in PPM. Credit: Keeling Curve. In the last year we have seen several records being broken; some bad and some good. On the bad side, the record loss of Arctic sea ice must feature in the top end and on the good side record renewable energy outputs were reported in Spain, Germany and Denmark which will feature on the good side. Now we might be set to reach another record and unfortunately it belongs to the bad record category. It’s no secret that global carbon emissions despite of the surge in green energy keeps going up. Global CO2 levels are measured in parts per million (PPM), the rising of these levels is also known as the Keeling Curve which is being monitored at the Mauna Loa Observatory in Hawaii, USA. Latest readings suggested that significant levels of 400 PM could be reached this year, and in recent weeks green groups have been building up to the fact it would happen. 400 PM is significant because never before in human history has global CO2 levels been that high. Now retired NASA scientist,James Hansen, engineered 350 PPM of which he said should the highest number of CO2 contained in the atmosphere if we are to avoid dangerous climate change. Since then 350 PM has been adopted globally as the benchmark we must adhere to and was also used by climate activist and author Bill Mckibben when he founded campaign group 350.org. Analysts are saying that even if 400 PM is not reached this year, it most definitely will next year. Each year global PPM levels peak in early May and some analysts have argued that it has peaked this year when it read 399.88 PM on May 3rd. Since then it had been steadily declining, recording 399.68 on May the 4th and 399.54 on May 5th but that was before the data from May 6th was showing that it’s rising again with the measurement of 399.71 being recorded. But regardless of what the final number will be this year, the world is showing no signs of reducing its CO2 levels. While it has fallen moderately in the European Union (EU) and USA it has been outdone by the growth in China, India and other emerging economies. Current progress on agreeing to a global climate treaty also seems at a standstill and at the recent climate talks which concluded in Bonn last Friday very little was agreed. Rather than a global deal small steps are being made, such as talking-up regulating airline emissions and both the EU and US have recently set regulations standards from emissions on cars and vans while in the background more and more noise is being made about having a global carbon tax system. This and a lot more will need to happen to redirect the route of the Keeling Curve. 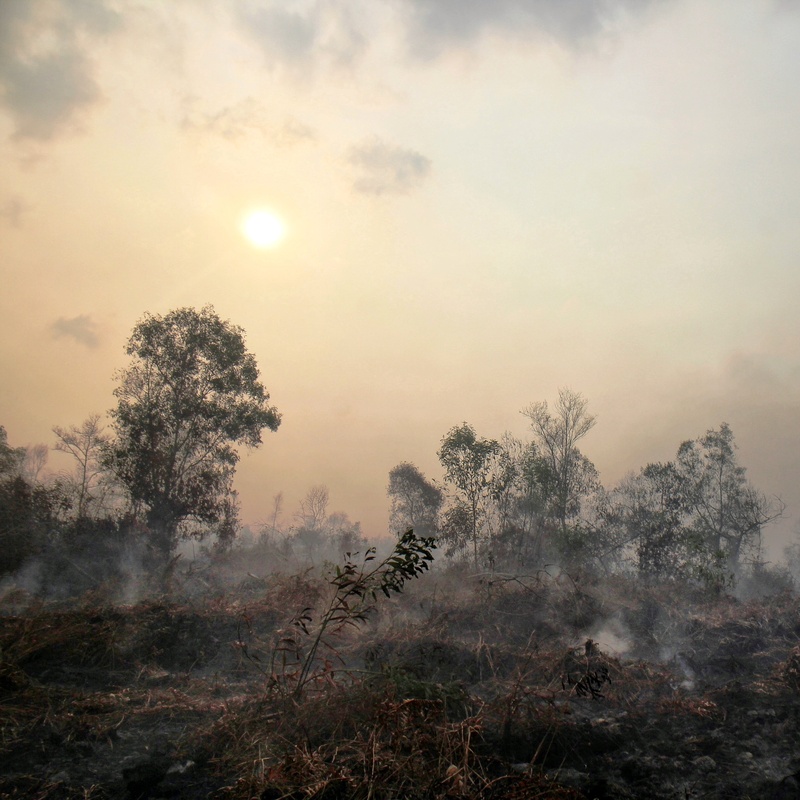 Scientists are saying no later than 2015 must global emissions peak and then rapidly start to decline to avoid dangerous climate change and limit temperature increases to 2 degrees celsius. You can follow the developments of Keeling Curve on Twitter. Interesting… no comments after a week !!! It exposed the CON of Carbon Offsetting this changed government and green experts view! … by pointing out Carbon Offsetting could not be achieved by planting trees etc. … but there was a strategic forgetting or could it be a cover up?